There has been no shortage of expectations for Guerrilla Games latest entry into the "Killzone" franchise. The studio has been known to push the graphical limits of hardware, and with its latest game -- "Killzone Mercenary" -- pegged exclusively for the PlayStation Vita, the anticipation has only grown. Guerrilla has more than met the expectations with "Mercenary," blending impressive visuals with engaging gameplay to create the definitive first-person shooter on the powerful handheld. Unlike previous iterations in the series, you are no longer exclusively fighting for the franchise's protagonist faction -- the Interplanetary Strategic Alliance (ISA). In the appropriately named "Mercenary," you play as Arran Danner, whose only loyal to the highest bidder. Though the story is not very compelling, the action is virtually non-stop. Taking on waves of enemy Helghast or ISA soldiers (depending on which side you're fighting for) never gets old, especially because the game rewards you with money for most everything you do and grades your performance with Valor cards. The better you perform on the battlefield, the better card you're given. This plays also ties into the multiplayer. The money you earn (both in single player and multiplayer) can be spent on a host of weapons and Van-Guards, which are similar to perks in "Call of Duty." One of the the more interesting Van-Guards is the Porcupine, which targets enemies on the screen and with a tap of the screen fires missiles at designated foes. You can customize your loadouts with specific armor, primary and secondary weapons, and grenades. The weapons have distinctive punch to them. The shotguns will lift foes off their feet while the automatic guns will fire a large number of ammunition. The one letdown is that you can't customize your weapons, so adding scopes or silences to weapons that are not equipped with them is not possible. The single-player mission structure is broken up into 10 contracts. You take on easily digestible contracts that can last between 15 to 20 minutes depending on difficulty level, fighting for the ISA as well as the Helghast. This bite-sized mission structure is good for gaming on the go, though there isn't manual save option so completing contracts is the only way to save your progress. For anyone who has played a "Killzone" game, that weighty feel to the gun play is back, but unlike its console brethren the methodical movement is perfect on the PlayStation Vita. With the screen so close to your face, twitchy gameplay would be too difficult to control. But the movement and targeting in "Mercenary" is smooth enough to precisely pick off multiple enemies. The gunplay is so engaging, you will forget that you're playing on a handheld. Melee combat is performed by onscreen taps and swipes, which trigger brutal finishing moves. If you sneak up on certain enemies, you can interrogate them for intel. Guerrilla didn't skimp on the visuals, either. 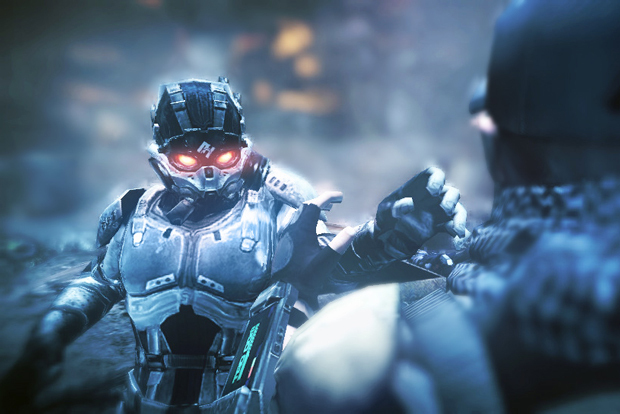 The developers have captured the level of visual fidelity the "Killzone" franchise is known for and condensed it to fit on the Vita. "Mercenary" is overflowing with detail, from war-torn structures covered in rubble to futuristic military bases, Guerilla has made few concessions in replicating the "Killzone" universe, which makes sense since the developers have said they're using the same engine as "Killzone 3". But what "Killzone" game would be complete without multiplayer? "Mercenary" offers three different modes, Mercenary Warfare, Guerrilla Warfare and Warzone. Mercenary Warfare is every man for himself. The player with the most cash at the end of the match wins. Guerrilla Warfare is team deathmatch. The first team to 40 kills within the 10-minute time frame wins. Warzone is a mode that combines multiple objectives -- Bounty Hunter has you collecting Valor cards from fallen enemies, Hacker tasks you with securing Van-Guard capsules, the goal in Interrogator is to extract information from downed enemies and Body Count is a form of deathmatch. As in single player, you are rewarded with money for every kill and objective completed. The Valor cards add another incentive to continue fighting online. The real question is if there will be a committed online community for a handheld game. Time will tell. If you're a first-person shooter fan and have a Vita, "Killzone Mercenary" is a must-buy. From the console-quality graphics to the immersive gameplay, "Mercenary" provides an experience that has not been replicated on a handheld. "Killzone Mercenary" is rated M for mature by the ESRB and is scheduled for release on Sept. 10 exclusively for the PlayStation Vita.